He was stopped outside the Brazilian embassy. 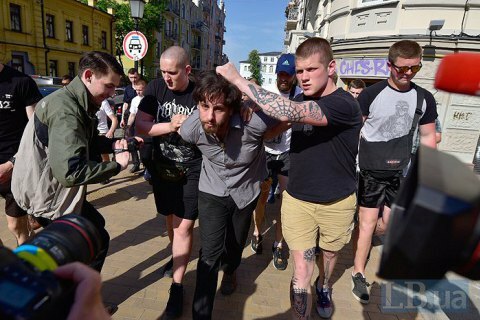 In Kyiv, nationalists have detained Brazilian national Rafael Lusvarghi who fought in Donbas alongside Donetsk People's Republic militants, an LB.ua correspondent has reported from the site. In his words, Lusvarghi was detained outside the Brazilian embassy. The activists want to take him to the Security Service of Ukraine. Lusvarghi, 33, came from Brazilian São Paulo to Donbas in the early autumn of 2014. Prior to that, he served for several years in the French Foreign Legion and also worked as a police officer at home in Brazil. During more than a year of his stay in Donbas, Lusvarghi changed several units. In the autumn of 2015, he left Donbas. However, a year later, on 6 October 2016, Lusvarghi was detained by the Security Service of Ukraine (SBU) at Borispol airport. He was lured to Kyiv by a false offer of a shipping job. Lusvarghi was sentenced in January 2017 to 13 years in prison. However, in August 2017, the verdict in his case was cancelled and a new trial was ordered. One of the reasons was a violation of jurisdiction. His case had to be considered not by Kyiv's Pecherskyy district court but by the Pavlohrad district court of Dnipropetrovsk Region. However, after the cancellation of the verdict, the Brazilian was not released. The measure of restraint for him was extended, and Lusvarghi remained in custody in the Kyiv remand centre. The Brazilian assured the journalists that he began to be interested in the Orthodoxy there, so he turned up at the monastery and considers becoming a monk. In December 2017, Lusvarghi was released from custody under a personal recognizance, under which he could not leave Kyiv, had to inform the court about a change of residence and appear in court on demand. The change of the measure of restraint was initiated by case prosecutor Ihor Vovk in connection with the upcoming exchange of prisoners . "He was planned for an exchange of POWs held by the Donetsk and Luhansk self-proclaimed republics, and thus had to have his measure of restraint changed. Because he is accused on such counts, according to which the accused can only be kept in custody. But a court wnt for it anyway," Vovk said. However, Lusvarghi was not exchanged. After this, the Brazilian did not return to prison either. When the initial measure of restraint expired, no-one decided on a new one for him, and thus Lusvarghi was free to move around Ukraine. "There was no court session in which we could legally choose or continue the measure of restraint because while the court of appeal and the Supreme Court were busy trying to decide on the jurisdiction, we could not select the measure of restraint at these meetings. It does not get extended or set at these meetings. It requires a preparatory [court meeting], which is to be held in June, which is why, unfortunately, this is what we have no," prosecutor Vovk said. Lusvarghi confirmed that he can freely move around Kyiv, but said that after the measure of restraint had expired, he never got his passport back. "Even when I was released, my embassy did not know what to do. Technically I can get all the documents and technically I can go where I want, but the Ukrainian state does not answer my embassy: can I be given a passport or not? Can I go or not?" Lusvarghi said. Prosecutor Vovk found it difficult to answer why Lusvarghi has no documents despite the fact that no measure of restraint has been applied to him. Lusvarghi will stay free at least until the next court session, which is scheduled for 6 June.